It may not come as a surprise to dog owners, but if these eyes are smiling - or "smizing," à la Tyra Banks - a pooch might be able to tell. 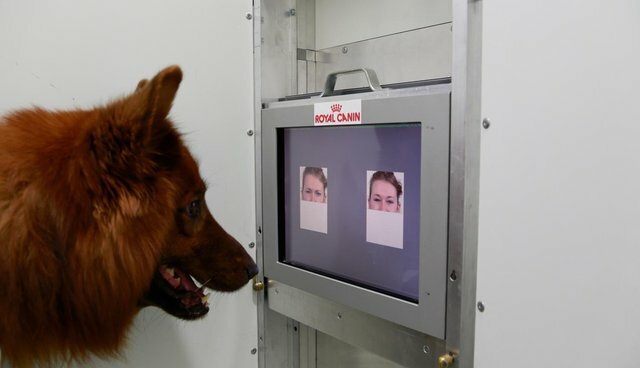 "[Canines] can tell that these two expressions have different meanings, and they can do this not only for people they know well, but even for faces they have never seen before," Ludwig Huber, Ph.D., a cognitive scientist and author of the study published in the journal Current Biology, said in a statement. Huber and his colleagues taught 11 dogs to look at pairs of photos on touch screens, showing people expressing anger and happiness. Half of the dogs received treats for selecting anger, while the other pups were trained to pursue happiness. To make sure the dogs weren't simply honing in on teeth or other traits, the researchers covered up different regions - showing half of a face or hiding everything below the eyes. "They seemed to realize that the smiley eyes have the same meaning as a smiley mouth and angry eyes have the same meaning as an angry mouth," Huber's colleague Corsin Müller, a canine cognition expert, told The Verge. Why could pooches tell when we're feeling up or in the dumps? Through experience, dogs could learn to associate our faces with our behaviors, Müller suggested to National Geographic. Come across someone rubbing a dog's belly, and chances are you've found a smiling human, too.